The Rolling Stones rock London. Again. The Stones rock Chelsea. Again. New York’s next. The Stones outside their exhibition in the King’s Road, Chelsea, London. Mick Jagger is said to be as “tight as a nun’s growler”, as former flames Jerry Hall and Marianne Faithfull have alluded, though not quite in those words. 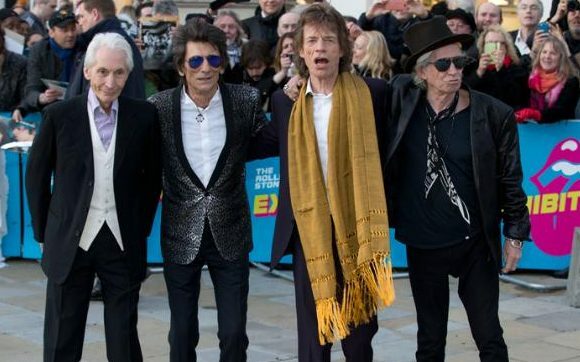 It was no surprise, then, to see tickets for EXHIBITIONISM, the Rolling Stones’ personal memorabilia exhibition, at London’s Saatchi Gallery, costing a hefty £21.50 each (US$27.87 at the time of writing). Mick certainly knows how to keep the money rolling into the Stones’ vault. But be warned. Buy online on certain sites and tickets will cost you at least double. 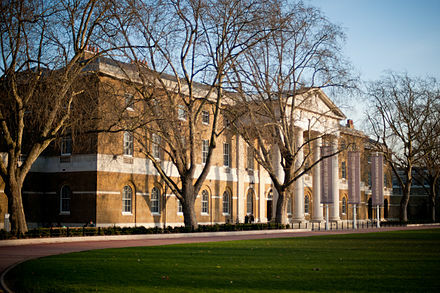 The Saatchi Gallery is housed here, in the Duke of York HQ building, Chelsea. Outside meant outside the stunning Duke of York HQ building in the King’s Road where the Saatchi Gallery is housed. Their Satanic Majesties couldn’t ask for a more majestic setting for their exhibition. Even though she saw the Rolling Stones way back when, my wife’s not a Stones fan in the true sense of the word. (Not if she couldn’t be bothered visiting such an exhibition.) But if you are a true blue Stones fan, it’s of course worth the entrance fee. This is because EXHIBITIONISM is a superb multi-sensory barrage of slick lighting, musical soundtracks, films, performances and all things Rolling Stones, magnificently curated by the people who design the band’s stage shows. 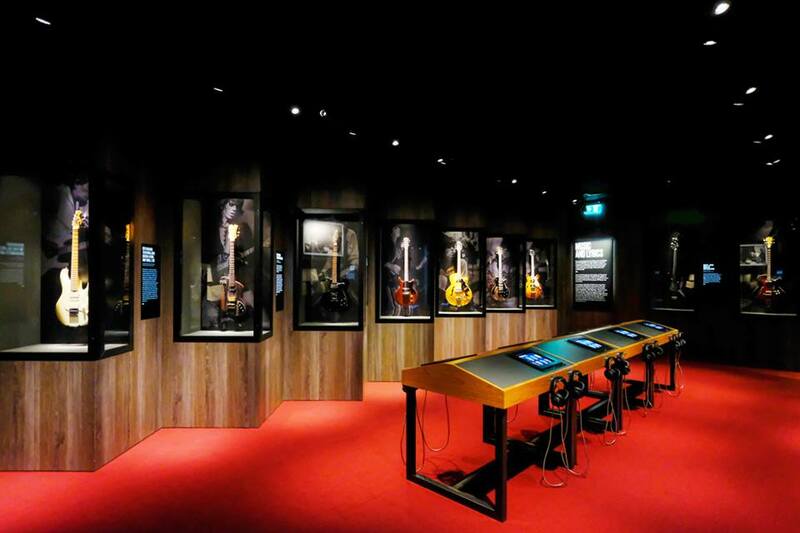 Filling nine themed galleries over two floors, you’re soon into a three-minute audio-visual journey, lit up on 40 screens, with a soundtrack blasting you through the Stones’ 55-year rock ’n’ roll career. Mind you, many of us have seen all this many times before so, after a quick squizz, I gave it a miss. I only had an hour, remember, not the recommended 90 minutes. Guitars, guitars and more guitars. More appealing were the rare and vintage Stones’ guitars, in numbers to make serious guitar collectors drool. There were also Charlie’s drum kits, Bill’s basses, Stones’ amps, recreated Stones’ recording studios, Stones’ mixing desks, Keith and Mick’s lyric books, Keith’s diaries and all the paraphernalia that goes with touring. My son, who had been earlier, was taken with how you could listen through headphones to rare sound archives, each breaking down Stones’ tracks to their individual instruments. For me, though, time was of the essence, so I whipped through that section too. Much has been made about the recreation of Keith and Brian’s squalid flat in nearby Edith Grove, Chelsea, “in all its revolting splendour,” as one newspaper put it. With its dishes piling up in the sink, three single beds in one small room and another in the other, I found it amazingly familiar. Just like the flat I shared up the road about seven years later. The only thing missing was the acrid stench of the obligatory dope smoke. 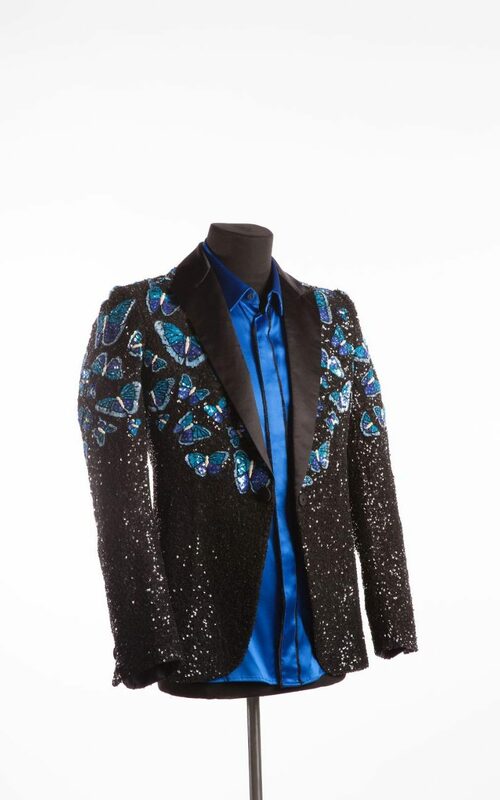 One of Mick’s jump suits. I prefer him in the jacket. Another gallery traces the development of the original Rolling Stones ‘lips’ logs design and shows its subtle changes over the years. Others display the various costumes the band have worn down the decades, including Mick’s various skimpy jump suits. No offence, Mick, but with nobody in them, they reminded me of empty pantyhose, and had me walking for the exit. 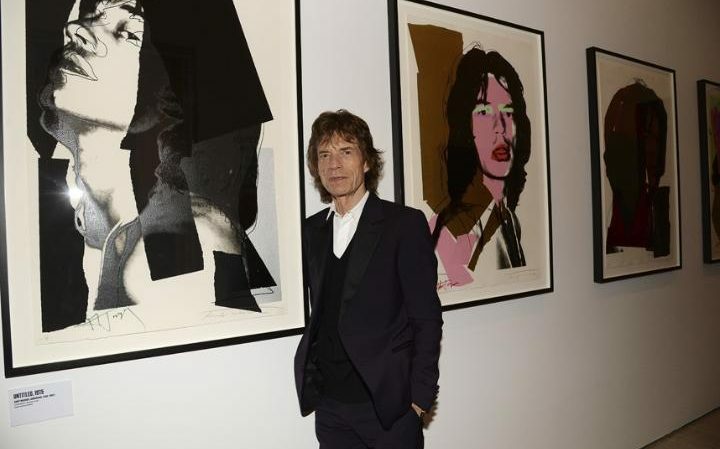 On the other hand, Andy Warhol’s Mick Jagger portraits were the best examples of Warhol’s work I’ve seen (and I saw many in a Warhol art exhibition recently). Mick with the Warhol Jaggers. Negotiate the flash jackets and jumping jack jump suits and you’ll reach the exhibition’s piece de resistance, an amazing 3D spectacular making you feel you’re part of one of the Stones’ recent live performances. It’s the masterwork of the entire exhibition which sends you out with a bang. After London, the exhibition moves onto 11 other cities including New York, Las Vegas, Los Angeles and Tokyo. I must say that EXHIBITIONISM is the best exhibition I’ve seen, even if it did cost over 20 quid. Thanks for the feedback, Ade. They’re not bad for a bunch of old pensioners, are they?